Taoiseach Enda Kenny announced the new jobs at an electronic trading company in Dublin and an Irish start-up telemarketing company in Carlow. Taoiseach Enda Kenny with David Furlong, the MD (Ireland) of Virtu Financials, at the opening of its European headquarters in Dublin. GOOD NEWS ON the jobs front: a total of 67 jobs have been announced by three companies in Dublin, Cork and Carlow. 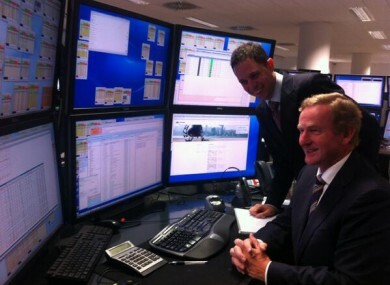 Taoiseach Enda Kenny made the announcement of 30 jobs at Virtu Financial, an electronic trading company, in Dublin city centre this evening. Virtu, which also has offices in New York, Austin and Singapore, is making its Dublin office its European headquarters. The company is hiring graduates in the areas of maths, computer science and other sciences. Speaking at the announcement, Enda Kenny said the jobs were a vote of confidence in Ireland’s “talented and flexible workforce”. The chairman of Virtu Vincent Viola praised Ireland’s talent pool of “well-qualified and highly-educated people”. Separately, the Taoiseach also travelled to Carlow for the announcement of 12 new jobs being created by an Irish start-up company. Maven TM, which was founded in 2011, is a telemarketing company which already employs 18 people at Carlow Community Enterprise Centre. It has won a number of contracts with multi-national companies in recent months, including Vodafone Ireland, which has led to the expansion. Enda Kenny said that the jobs showed the potential for “other local communities, businesses and state bodies to work together to create jobs locally”. In Cork, business advisory firm Grant Thornton has officially opened new offices where it plans to hire 25 people in the area of tax planning, financial accounting and advisory services. The company already has offices in Dublin, Limerick, Kildare and Galway. Email “Good news on the jobs front: new jobs announced in Dublin, Cork and Carlow”. Feedback on “Good news on the jobs front: new jobs announced in Dublin, Cork and Carlow”.